It's Commisionin' Time again. Thought I was done with this last week but, I was wrong. Sorry 'bout that. People often ask if X-men 172-173 were directly influenced by the Claremont/Miller Wolverine mini series and the answer is, absolutely. Chris never asked that I draw like Frank but, wondered if I couldn't carry through on the page design Frank was playing with; To make this a companion piece or denouement to the mini series. Made sense to me and it was fun trying to figure out the why's and wherefores of what Frank was doing (I don't know that I'd even seen manga at this point) and it gave everything a stranger in a strange land, I don't think we're in Kansas anymore feel. The other question I get is if the climactic battle was me or Chris. Chris was always happy to let me play and bring my good stuff for those parts of the story that were more purely montage rather than exposition. As long as I brought everything back to the path the story needed, I was free to take the scenic route. I forget exactly what Chris had envisioned, just that it struck me as a little too cerebral for Wolverine as I understood him. My Wolverine was based on three people I knew. Two were Audey Murphy types, tiny little guys so cute you wanted to pinch their widdle cheeks. The third was my father who, at 6 feet 180 pounds, was far from tiny. The one thing they shared in common: You cross THIS line, now you're dealing with a stone cold killer. The Viper and Silver Samurai had tried not just to kill the X-men, but Mariko, his fiancee, as well. Logan was done talking. 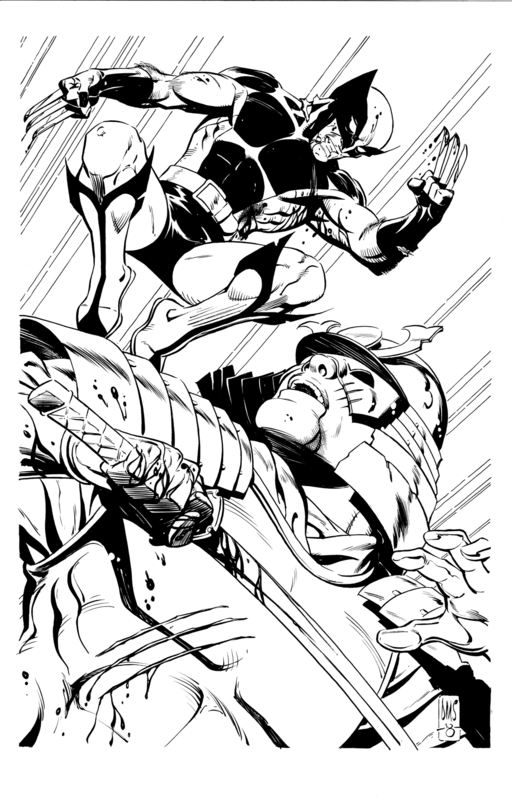 As far as he's concerned, he and the Samurai are going to trade shots until one of them is dead and he would have pulled it off had he not been distracted by the life threatening injuries to his new buddy Rogue. I briefly pondered a Gil Kane like opera of violence. An explosion here, an explosion there in the hopes it might made the scene bigger, longer, epic-er. Ultimately I stayed with the original idea of simply trading shots. Each shot leads directly to the next, and the next, and the next. While this reduces the fights duration to 3-4 seconds, somehow that seemed appropriate given Logan's state of mind. We've already discussed the origins of punk Storm and Kitty's reaction in April Fools. The only anecdote left I can think of is Maddy Pryor's meeting Lockheed. Maddy had seen Scott zap a hole through a spinning quarter, Storm flying in, Kitty running out in tears, the furry blue elf that is Kurt and she's taken it all in stride... life in the Marvel Universe, what can you do? But, how's she going to react to Lockheed? So I plop Lockheed in her lap and play with some Chuck Jones timing, "Who are these people and what have you gotten me into?" 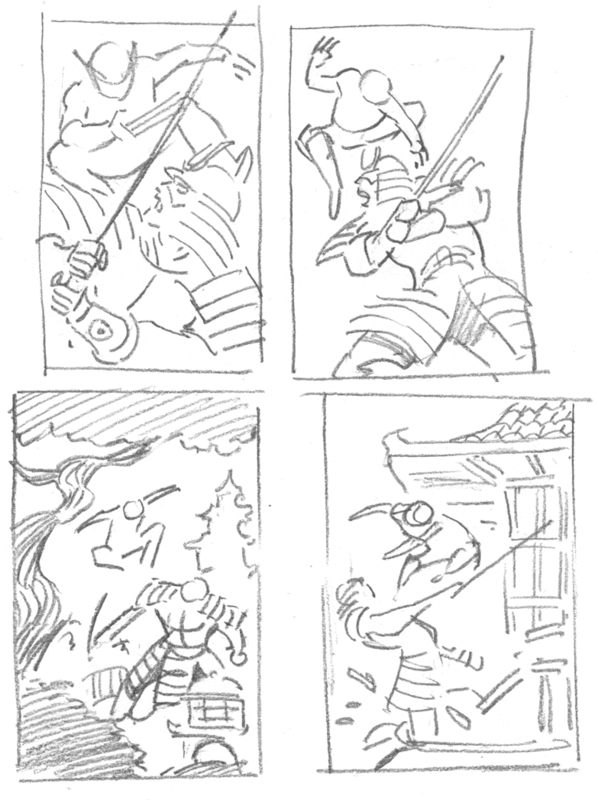 Ladies and germs, the Wolverine Samurai Shuffle. Great commission inspired by a favorite moment! I love this piece and I'm filled with envy for the new owner! I think this sequence is my favorite moment in your run. I assumed it was likely to be inspired by Miller's own sequence, but I've always held this one closer to my heart. 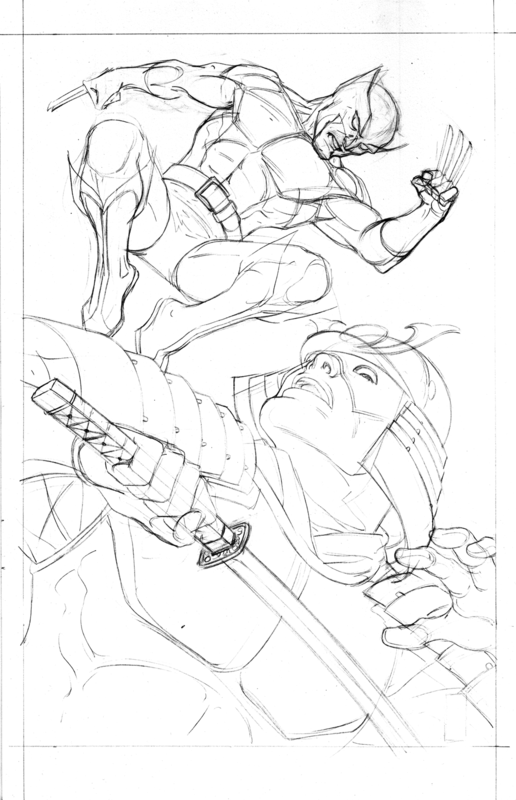 I started a commission jampiece that was inspired by it, replacing Silver Samurai with Sabretooth (so they could go on murdering each other indefinitely). Thanks for sharing!